Congratulations! Care for Dogs is a foundation at last! When my recent story about superstition and psychic awareness was published on this page some 2 weeks ago, comparing the Western manifestation of this all-too-human and fascinating trait with the Thai equivalent, I had no idea that, within a week or so, I would be welcoming a famous mystic to our city and, hopefully, to our newspaper. Famous astrologer and psychic Ofer Cohen, now resident in Chiang Mai, shown concentrating on a Tarot card reading for a prominent politician. Ofer Cohen is the astrologer and tarot consultant for ‘Hello’ celebrity magazine’s India issue, and is also more than well-known in the West. In the course of his work he has been consulted by Bollywood stars as well as Western celebrities, famous politicians and a number of important names in the business and financial world. After living in India for 9 years, Ofer has recently, with his Thai bride, moved to Chiang Mai and is planning to settle here long-term. Why Chiang Mai? According to this particular soothsayer, as soon as he set foot in the city, he knew that his home was here! The majority of us will know exactly how he felt, I suspect! This amazing man is originally from Israel; his family are Yemeni Jews, a group famous for their psychic abilities and their study of the Kabbala, an esoteric and ‘secret’ form of Judaism made famous in the West by celebrity participation, particularly that of Madonna! Ofer’s grandfather was famous for his predictions, his knowledge of the secret doctrines and his herbal cures and recipes, and predicted that his grandson would carry on his legacy. 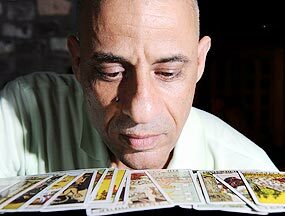 At the age of 16 Ofer realised his grandfather was right, as he became aware that he could predict events without using Tarot cards or consulting astro-charts; what became a lifetime study began with his realisation that he could ‘read’ peoples’ faces. His grandfather was able to guide him through the process of dream-recognisation, which became one of the young practitioner’s specialities. In early adulthood, Ofer began practicing astrology and palmistry in France, successfully incorporating his ethnic knowledge, instincts and sensitivities into the Western modes of practice. Within 5 years, at the age of 27, he was an acknowledged expert in palmistry, Western astrology and the healing uses of medicinal herbs. During further study, he became fascinated by the European gypsies’ Tarot skills. Back in Israel, with his psychic abilities combined with a love of nature, he began to predict and diagnose medical conditions, using his knowledge of herbs to create a variety of powerful home-made and well researched recipes to cure a variety of ailments including high blood pressure & arthritis. In 1999, Ofer left Israel for India, to further his studies of Buddhism and the Tantric Vedas, spending the first three years amongst the magnificent mountains of the Himalayas. His subsequent move to Mumbai resulted in his being employed by the Grand Hyatt Hotel Company to travel between London and Mumbai giving tarot readings, lectures, workshops and guidance to people from all walks of life. At present, Ofer, apart from his work with Hello Magazine, is involved in the production of two spiritually-based films dedicated to the awakening and enlightening of seekers worldwide. His main focus has always been based on his compassion and his understanding of the human need for help. Here in Chiang Mai, Ofer would like to be able to help and guide the readers of this newspaper. He has suggested that, if readers would like their dreams analysed, or questions about the future or specific issues answered they should email him privately on [email protected], sending details together with their date, time and place of birth. With readers’ permission and anonymity, Ofer would like to write a regular column for this page giving details of dreams analysed and answers given, and plans, hopefully, to expand to other concepts at a later date. After 3 tough years of working towards this goal, Care for Dogs has finally become a registered charity. It was a huge struggle involving a lot of work liaising with lawyers and other parties to ensure that very important and rigorous requirements in Thai law were met; satisfying various levels of government offices, responding and chasing endless clarifications and, of course, paying the various processing fees. A demanding task in itself, even without the day-to-day jobs involved in running the shelter and caring for so many dogs! Setting up a foundation requires a committee, a formal structure and an independent accountant, amongst other things; establishing these necessities was not without difficulty. At last, and thankfully, Care for Dogs can now change its formal name to the ‘Care for Dogs Foundation’. Interestingly, this name was possibly one of the biggest hurdles to jump, as the implicit concept was not something easily recognised by Thailand’s legal bodies. As a result, in order to appease the authorities and attain our objective, it was necessary to ‘design’ a Thai equivalent term to partner the English one. ‘Munity petak rak sat pua san com’ or ‘Foundation Protect Love - Keep Animal for Social’, when translated into English from Thai, is slightly longer than was envisaged but at least it met with government approval! So there it is - Care for Dogs is now very pleased to become registered in Thailand and the certificate will be proudly displayed at our shelter. The entire team has registered hearty congratulations to all its members, for all their dedicated hard work, for staying the course and never submitting to ever-present pressures to take the easy way out. The Chiang Mai Mail and, we’re sure, everyone who knows and has supported this newly-formed charity in the past, congratulates the team and wishes them a great future doing what they do best – caring for dogs! Opinion: Land-grabs – apparently we’re all at it! Following last week’s news about the illegal purchase by foreigners of farming land in the kingdom aided by Thai lawyers and nominees and the drastic draft bill which is being put before the cabinet by the Ministry of Agriculture and Cooperatives, another report published this week casts the net even wider to include all foreigners who have given their wives/partners money in order to provide their new family with a secure home. It seems possible that investors from the Middle East bent on acquiring food security may well be assisting with the finance needed to buy up farming land from growers. Many farmers have had enough of working in uncomfortable and difficult conditions all year just to make an average loss of 33% on their costs, when the rice mills, wholesalers and storage companies are prospering even if the guaranteed government price proves inadequate or in need of emergency revision upwards. Selling your land to a legally established company with a minority of foreign shareholders and plenty of cash for investment, then leasing it back and working it without the burden of responsibility seems a good solution for those impoverished through faults in the system. Seriously, though, Thai marriage convention requires a dowry from the bridegroom. Surely the gift of money to buy land, which is then registered in the new wife’s name, is a dowry intended to provide a home and security in gratitude for the care which the vast majority of Thai wives give their mostly much older husbands? It does seem that this issue, which appeared recently on the UK’s BBC News network - another case of Thailand shooting itself in the foot internationally –, is just another attempt to identify foreigners as the threat they most definitely are not! Maybe this will divert Thai nationals’ minds from the present political and economic uncertainty for a while, but the introduction and enforcement of this draft law would cause tragedy for many thousands of mixed marriage families across the kingdom. A little more objectivity and thought on the part of the law makers might be an excellent idea. Notes : A lawyer states that, under former Land Office policy, Thai nationals who married foreigners were prohibited from ownership of land in Thailand. This prohibition was based on principles of community property law and a general presumption that the Thai spouse was holding the land for the benefit of the foreigner. However, under current Land Office policy the Thai spouse can own land in Thailand, provided that the foreign spouse signs a letter declaring the property to be the separate property of the Thai spouse and waiving any interest in the property. Not, it would seem, after the turn of this year, if the Ministry has its way. No grandfathering, we suspect, will apply. And nobody’s coming to town. And everyone’s cutting right down. And the Shangri’s lost its La ! What the hell to do ?